Opposition Leader, Bharrat Jagdeo on Wednesday flayed the one-year old coalition-led administration for taking credit for several projects initiated by then People’s Progressive Party Civic government, while at the same time burdening Guyanese with higher taxes, joblessness and reduced confidence in the economy. “The people do not have confidence in this government and every single day they do things to erode that confidence further,” the Russian-trained Economist told a news conference at the PPP’s Headquarters, Freedom House. The A Partnership for National Unity+ Alliance For Change (APNU+AFC) coalition barely clinched a one-seat majority in the 65-seat National Assembly with just over 4,000 votes at the May 11, 2015 general and regional elections. Among the contributory drawbacks that the Former Finance Minister pointed to were the rescinding of leases to farmlands, taking legal action against people who have titled land, and the seizing of core homes. “Once again, people don’t feel safe about private party,” he said. Jagdeo also accused President David Granger of announcing a reduction in incentives to foreign investor when they are here based on a 2002 report that had cited a high level of tax remissions. “In one week, in one statement he has killed every promotional activity we have done on investment because why would people come now if the tax concessions and incentives to come here are going to be changed not in their favour but against them,” he said. The former President noted that the APNU+ AFC-led government has also removed the incentive on mining and agricultural equipment by instituting a 16 percent Value Added Tax (VAT) that now runs into millions of dollars for a single purchase. Jagdeo further observed that government officials were separately sending mixed signals to investors. Saying that so far the government has failed to attract any major investment over the past year, the Opposition Leader said instead it has claimed credit for the construction of the Giftland Mall at Liliendaal, East Coast Demerara, the building at Providence, East Bank Demerara owned by Ramnaresh Sarwan that houses Massy’s Supermarket, and the call centre, Teleperformance, at Robb and Camp Streets, Georgetown. “They are so desperate that they are saying they brought 4G to Guyana as part of their investment. It is like we saying we brought cell phones because when we took office, you had about 300 instruments, now you have about 700,000. The PPP should say we brought cell phones to Guyana,” he said. It was under the PPPC administration that the liberalization of the telecommunications sector was held up for several years and no spectrum was allocated to Digicel or Guyana Telephone and Telegraph (GT&T) to facilitate the migration from 2G to 4G data speed on mobile phones. However, Jagdeo accused the APNU+AFC of blocking the liberalization process at the level of the parliamentary select committee. He disputed claims by the A Partnership for National Unity+ Alliance For Change (APNU+AFC) administration that Guyana’s economic slowdown was due to a reduction in drug proceeds. Instead, Jagdeo calculated that, based on claims that the PPPC-led administration had stolen monies from various sources or had facilitated the smuggling of large quantities of gold that the economy should have had about half a trillion Guyana dollars to spend. The Opposition Leader said by the government’s own claims that 15,000 ounces of gold were being smuggled out weekly, the economy should now have been able to gain US$800 million of legal flows. 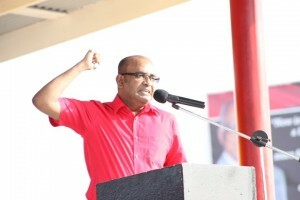 Additionally, he Jagdeo hoped that by now government would have been able to prevent the leakage of GYD$150 billion or 30 percent in outflows, another GYD$28 billion in savings that the PPPC was allegedly stealing from public procurement and US$200 million in savings from reduced global oil prices. Still on the economic side, he said a recent eal between government and Demerara Distillers Limited over long outstanding customs and excise taxes dating back to 2002 has set a dangerous precedent that would see several companies taking legal action to be given similar treatment. If the Guyana Revenue Authority (GRA) decides to do so or the High Court rules in the companies’ favour, Jagdeo predicts that the National Treasury would lose at least GYD$60 billion. “Watch how the story will unfold over the next few months. Watch it as other companies come forward to claim their refunds because they will have to get it because once you settle on one basis for one company…,” he said, adding that the GRA has been politicized and removed the a level playing field. 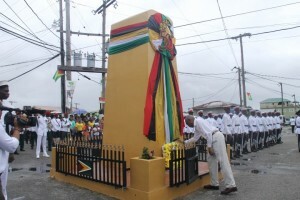 President David Granger laying a wreath at the Cenotaph in Bartica during the declaration of that district as a town. The Opposition Leader further charged that the declaration of township status to places like Bartica was merely a political gimmick because there is no infrastructure to help create the conditions for Granger’s dream of the development of small businesses to become a reality. “What we feel is that it will bring greater hardships on people rather than bringing better services to them and when,” he said. Jagdeo further noted that the President’s talk of small business development has come at a time when the government has just increased taxes and fees for 140 licences while at the same time displacing vendors and taxi-drivers from places such as the Stabroek Market Square. “How could this be a big fillip to the development of small businesses when in the name of cleaning the city, you are decimating the livelihood of people who have very little choices but selling outside the market and earning to feed their family,” he said. More than 100 vendors have since been temporarily relocated to a vacant plot of land on Hadfield and Lombard Streets. The then PPPC-led administration back in January, 2011 had demolished several structures around the Stabroek Market area in a bid to end vending there with permanent stalls. No alternative accommodation had been provided on that occasion. Jagdeo stressed that the PPPC was not opposed to the clean-up of the city and the removal of criminals from the Stabroek Market Square. “We are not against cleaning up the city. We support the government in cleaning the city. We will support that and we will support the government if it is focused on removing criminal elements from the market square but you can do both things without taking away people’s livelihoods,” he said. Based on the clean-up exercise around the area, it is evident that most of the drains around the area have not been cleaned properly in decades. Lamenting that the APNU+ AFC government has “killed” the Amaila Falls Hydropower project for political rather than financial and technical reasons, he said the country has lost a facility that could have saved the treasury at least US$2 billion in 20 years at 2012 prices for oil and gas which which would have seen the Guyana Power and Light buying electricity at 10 US cents per kwh- about the same that is being paid now that global oil prices have fallen. Jagdeo, who had spearheaded the Low Carbon Development Strategy (LCDS) through which Norway had agreed to pay Guyana US$250 million to preserve its standing forests to absorb greenhouse gases, criticized the Granger-led administration for losing the vision of a green economy. “The green economy is not about planting trees. It is an economic concept and further to the money earned because of the arrangement that we had on the forestry deal. …We are not sure about anything about the green economy. They have no conceptual framework, no vision excepting in implementing in a haphazard way some of the things that we have left,” said Jagdeo who is a global crusader on climate change. President Granger has announced that the town of Bartica would be a model green economy that would supply solar and hydro electricity and recycle waste. He also recently announced that one of the aims of his administration is for all government buildings to be supplied renewable energy over the next four years.